The Jinn family lives in a small town where Jute and Fina go to school. Their parents want them to learn more about humans, but the twins are impatient about the human version of the world. Without their parents knowing, they create an alchemy machine for a science project. Jute and Fina Jinn stood on the top bar of the swing set with their arms raised high. If the twins wanted, they could fall and let the wind carry them miles away. But they didn’t. They were at recess at the Conwell School and weren’t allowed to use their powers in front of humans. “Well, not full magic,” she said. Jute checked the other end of the playground, where a teacher watched a group of girls jump rope. “Sure, but nothing too fancy,” he said. Anyone could tell right away Jute and Fina were twins, with their round features and browned skin. Both had black hair and silvery blue eyes. They wore loose black pants and a vest over a white silky top, and shoes that curled upward with tiny bells on the tips. The bells on Fina’s shoes jingled as she did a little dance on the bar. Jute stood on one leg without losing his balance. Dancing or standing on the top bar of a swing set was cheating a little. Humans could do both if they were the Great Italianos, the family of acrobats from Happy Jack’s Carnival of Mysteries, where the twins and their parents once performed a magic act. Now, the Jinn family lived in a small house in the middle of an apple orchard. Their parents, Mira and Elwin, didn’t let the twins fly or be invisible even though jinn, or genies as many humans called them, can do either easily. A jinni, which is one jinn, can also change shape and cast spells. No other jinn lived in the town of Conwell, so the twins were supposed to pretend they were human. It meant they did things the hard way and at a human-normal speed, so anyone who met Jute and Fina would think they were an ordinary eleven-year-old brother and sister. Jute and Fina looked down. The voice came from Brian Morgan, the worst boy in the fifth grade and without a doubt, the whole school and maybe the entire town of Conwell. Brian stood below the swing set. Short, brown hair covered his round head as if it was a big, fuzzy fruit. His eyes were small. When he drew them tightly they became dark dots. 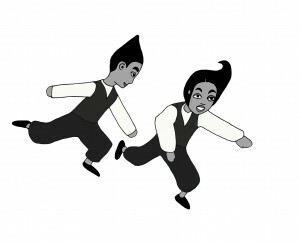 The twins lifted their eyes to the clouds floating above the school. They didn’t say a word. They weren’t going to let Brian know they could hear them. No matter what they said, the boy would turn it into a joke. “Do you hear something, Fina?” Jute asked. The boy jumped several times. “Hey, hey, look at me,” Brian yelled at the twins. Fina kept her eyes on the sky. “I think so, but maybe it was a bird,” she said. Brian leaped onto one of the swings. He rocked it back and forth as if he could bump Jute and Fina off the top bar. Of course, he couldn’t. The swing set was made of steel and too heavy for a boy even Brian’s size to budge. Besides, it would take more than a fifth-grader to knock the twins off the bar. Maybe a tornado or a lightning bolt could, but then again, the twins, being jinn, could handle either one. “Hey, Flute and Hyena, I’m talking to you,” Brian yelled. Those were two of Brian’s names for the twins. He started making them up on their first day at the Conwell School. Hoot and Greener. Cute and Cleaner. Toot and Weiner. The other fifth-graders laughed when they heard the names. They were glad Brian wasn’t picking on them. Fina closed one eye and focused the other on Brian. “Are you talking to us, Brian?” she asked the boy. The boy lifted his chin. His eyes shrunk. Brian’s head bounced from side to side. He made loud snorting laughs but he stopped when Jute rolled in a cartwheel he ended with a handstand on the top bar. Jute stared upside down at Brian Morgan. The bell rang. Recess was over. The twins somersaulted to the ground in front of Brian Morgan. Fina planted her hands on her hips. “Why do you ask?” Fina asked the boy. “Cause you both look like clowns in those clothes,” Brian said, laughing hard at his joke. Fina jabbed a finger against the boy’s chest so hard and fast he hopped backward. “Be careful or I’ll put a spell on you,” she said. Brian’s eyes locked on Fina’s. Fina could make either of those two spells happen. She was thinking about which one would be better when Jute tapped her shoulder. Fina nodded. If she changed Brian into a pig or a bug, she wouldn’t be able to turn him back into a boy. Humans can’t handle that kind of change. Neither can animals. Fina found that out after she shrunk a goat to only a few inches. She thought she was saving the animal from an unhappy life. Fina planned to make the goat full-sized when she found a good home, but her mother told her it was impossible. Resa the goat would be tiny forever. Fina learned her lesson although she loved the goat that was now her pet. Fina made a low laugh.